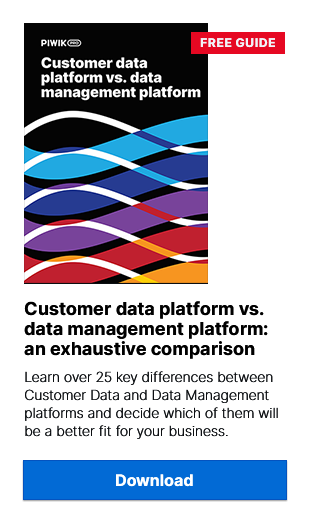 The power of a Data Management Platform (DMP) is based on creating specific audience segments and activating data about those audiences in the right way. All this sounds ideal in theory, but what about real-life examples? In the following post we have decided to show you a couple of simple examples which hopefully will give you a better idea of how a DMP can be used. Let’s imagine that you are running a successful e-commerce website that attracts a lot of clients every day. Your employee team is also growing dynamically. But in addition to this success, you are also constantly thinking about improving your marketing efforts and increasing your traffic and sales! That’s only natural – there is always something more than you can do, of course! Okay, so you have created a mobile app with various functionalities aimed at smartphone users who are visiting your e-shop. Of course, you have created your app on iOS and Android. What you need now is to be able to track the app’s users. Having those two distinct groups of users, you can create banner ads and popups fitted more precisely to the mobile users. You can also create messages about your app which will match the preferences of the visitors – one with app in Google Play and the second on the AppStore. Obviously, this is just one of the examples of using Piwik PRO Analytics Suite DMP. Now let’s go to the world of web browsers. Let’s say you are an experienced SEO expert and you are starting a website which helps visitors grade a website in terms of Search Engine Optimization. But besides the website itself, you have come up with a browser extension which user can use to check his or her website’s SEO score directly. But naturally, there are a couple of major browsers on the market, so you have created add-ons for Mozilla Firefox, Google Chrome and Opera. New and returning visitors can be seperated via Piwik PRO Web Analytics segments and this data can then be imported to Piwik PRO Analytics Suite. Once again, let’s assume that you are running a rather large website which aggregates information about professional training and workshops on a lot of different topics. These workshops take place across the whole country and there are quite a few offers and slots for future attendees to consider. Now you are wondering how to efficiently target the right users – located in specific cities or regions. After creating multiple audiences based on combinations of the characteristics above, you will be able to create precisely targeted messages. For example, you could communicate a new life coach training in Los Angeles to people from the LA area who visited multiple pages about life coaching on your website. The main goal of using a DMP is to properly recognize of your audience and, after segmenting them, create efficient marketing communication. Communicating general messages to all the visitors is similar to creating marketing campaigns with very basic targeting – only a small percent of people will be interested at all. We don’t like poorly fitted ads which promote things completely irrelevant to our interests, so why should you settle for that kind of marketing communication? Check out Piwik PRO Analytics Suite and see how you can come up with more and better ways to engage your audience. When Can You Use PII for Online Advertising and Marketing?